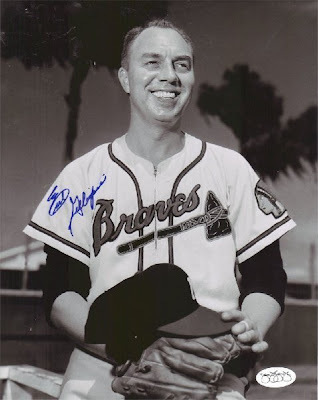 Those of us from Milwaukee who are old enough to remember the Milwaukee Braves will never forget the voice of Earl Gillespie, their announcer from 1953-1963. Gillespie was well-known and loved for his exuberance and for his use of the phrase "Holy Cow" during a ballgame's most exiting moments, and he was chosen to broadcast the World Series for NBC in 1957 and 1958. 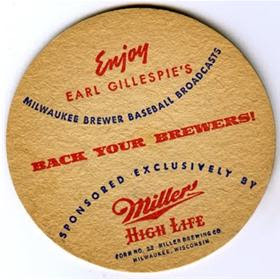 Earl started his broadcasting career in Green Bay, Wisconsin after serving in the U.S. Army Air Forces in World War II. 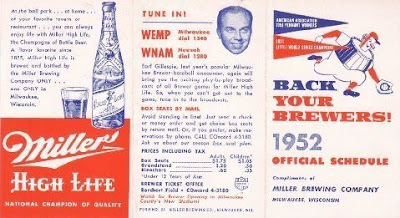 He became the voice of the Milwaukee Brewers in 1951 with WEMP radio and performed those duties for the club's final two seasons. Almost instantly, Gillespie became the public face of the Brews, and his name (and face) was prominently featured on many of the club's promotional materials. You may not be aware that Earl also had a baseball career, which included a brief stint with the American Association Milwaukee Brewers. A young 17 year old Gillespie began playing for the Class D Green Bay Bluejays (Wisconsin State League) in 1940. In 1941 Earl played with the Fond du Lac Panthers and later again with the Bluejays in 1942. 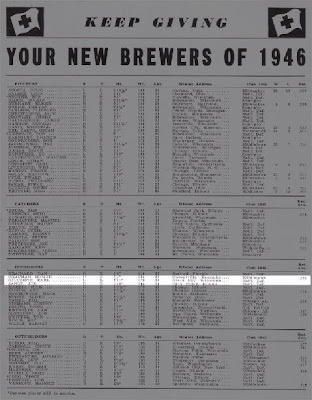 After World War II, Earl returned for a tryout with the Milwaukee Brewers during spring training in 1946, but unfortunately he didn't make the team. He finished his playing career back with the Bluejays. Earl played in a total of 368 baseball games, compiling 366 hits and a .269 Batting average. Overall his defensive play was very good, with a .986 fielding average. 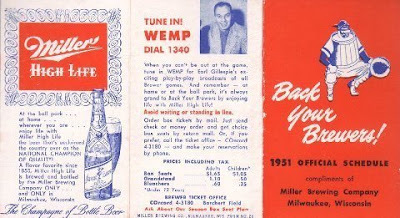 When the big league Braves moved to Milwaukee, they recognized Gillespie's talent, and his voice guided Milwaukee's baseball fans through a seamless radio transition from the American Association to the National League. After leaving radio for to television in 1963 as a sportscaster, he became the Sports Director for WITI TV6 Television (1963-1985). Earl earned the "Wisconsin Sportscaster of the Year" Award 8 times and was inducted into the Wisconsin Athletic Hall of Fame in 2001. Obviously his announcing skills were better than his play at first base, and generations of baseball fans would agree that he made the right career choice.